"This roast smells so good in the oven, and is really great thinly sliced for sandwiches the next day." Preheat the oven to 325 degrees F (165 degrees C). In a small bowl, mix together the caraway seed, salt, mustard powder, thyme, oregano and vegetable oil to make a paste. Place the roast in a roasting pan fat side up. Rub the spice mixture into the top and sides of the roast. Insert a meat thermometer into the roast, and place in the oven. Roast for about 1 hour, or until the internal temperature reaches 155 degrees F (67 degrees C). Remove from the oven and let rest for 15 minutes. The temperature will rise to 145 degrees F (63 degrees C). Slice and serve. Caraway seeds may be crushed using a mortar and pestle, or ground in a spice grinder, clean coffee grinder or food processor. Excellent. I only took away one star because the cooking time was not enough. The inside was still raw. Other than that, it was good. 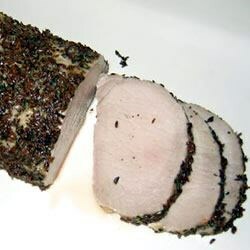 The whole family loved this recipe...the coating tasted great without overpowering the flavor of the pork. We had it with potato pancakes and apple sauce...YUM! Yes and it's wonderful.I did make it again and added apple butter left out Italian spices and added garlic.Turned out great ! Nothing special but still a good recipe. I used the left over meat to make a wonderful sandwich.